Wow! We are excited to announce that all of the seats on the CCOC property tour bus have been taken. If you can’t make the tour, join us for the wrap-up party at the 464 Metcalfe meeting room from 12 – 1 p.m. on Saturday, September 9. 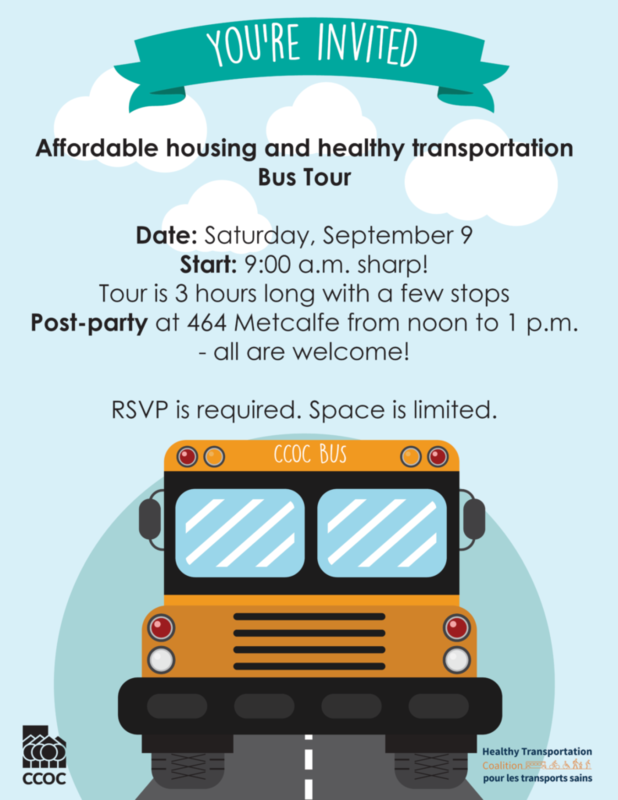 Join us for a bus tour of some of CCOC’s properties and a discussion about how healthy and affordable transportation options affect people who live in affordable housing. We’ll talk about the links between housing and transportation and look at examples of challenges and opportunities in our neighbourhoods. Topics include light rail, OC Transpo, ParaTranspo, VRTUCar, cycling, and complete streets. RSVP to reserve your seat on the bus.